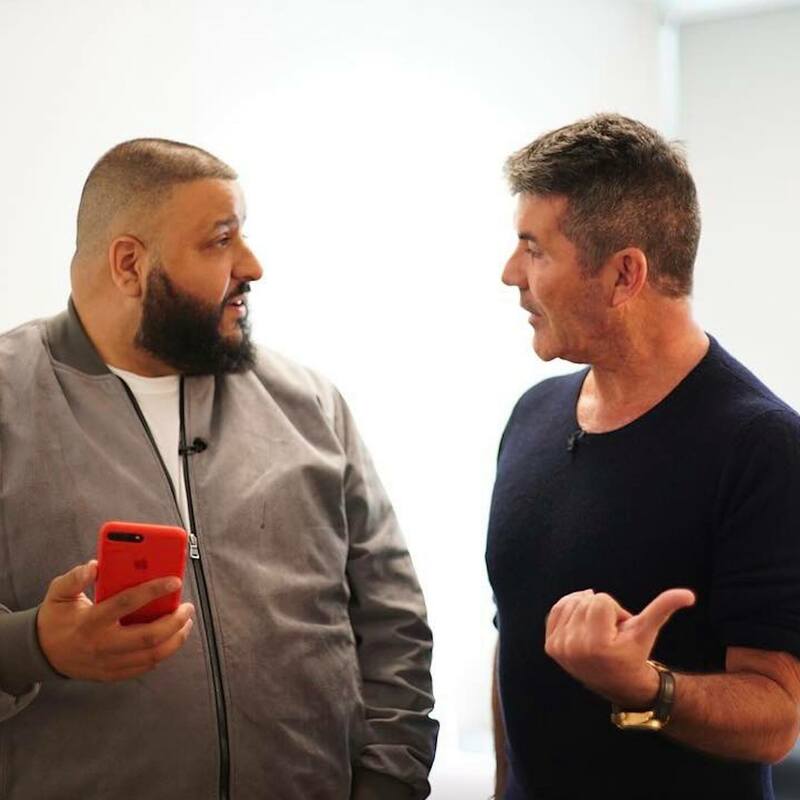 Producer and music mogul DJ Khaled visited America’s Got Talent! He joined Simon Cowell, Heidi Klum, Mel B, and Howie Mandel at the Season 12 Judges’ Desk for the second round of Judges’ Cuts. Just like last week’s guest judge, Chris Hardwick, DJ Khaled had the opportunity to give one lucky act: the Golden Buzzer. Who was the lucky recipient of DJ Khaled’s Golden Buzzer? Read on to find out. After Tyra Banks had encouraged the acts to do their best and fight for the seven spots, the audience roared for guest judge DJ Khaled, who made an epic entrance. Up first to face the quintet was 22-year-old Miami native Sammulous, who performed the disco anthem: “You Make Me Feel (Mighty Real).” He has powerful pipes, and I loved his stage presence! Plus, his falsetto was out of this world! DJ Khaled stated that he was “incredible,” while Simon was very torn about his performance. Meanwhile, Heidi begged her fellow judges that Sammulous had to be in the live shows. 44-year-old New York City comedian Steven Scott hoped to replicate his standing ovation that he received during Judges’ Auditions. His routine involved his mother’s lack of knowledge regarding voice mail. He made smile, laugh, and received some high praise from DJ Khaled, Mel B, and Heidi Klum. Meanwhile, The Quiddlers returned to the stage dressed as the judges as they danced around to the Spice Girls’ “Wannabee.” DJ Khaled their routine funny and amazing, while Simon stated that he needed to take Simon Quiddler home with him. There were incredible dance acts that faced off to impress DJ Khaled and the America’s Got Talent judges. Siblings and ballroom dancers Junior and Emily owe their dancing ability to their father, who enrolled them in salsa lessons. Their choreography was outstanding, and my jaw dropped all throughout their 90-seconds. However, Junior and Emily’s routine divided the judges as both Mel B and Simon thought that their routine was way too short, while Howie stated that he would be fighting for them during deliberation. Jokgu, the Keyboard Chicken, returned for Judges’ Cuts and she brought a secret weapon to the Judges Cuts. After the judges had brought DJ Khaled up to speed, Jokgu’s sister made an appearance to perform a duet. Unfortunately, the chickens did not perform, so all four judges buzzed and eliminated Jokgu and her sister from the competition. Dakota Striplin kicked off the singers’ round with “I Can’t Help Falling in Love with You.” Meanwhile, Chase Goehring performed another original song called “A cappella,” which hoped that he could showcase his uniqueness as a musician. He reminded me a lot of Ed Sheeran because I see a lot of his mannerisms in him. Chase is a strong songwriter, but I do not need another Ed Sheeran in my life. Chase received a standing ovation from Howie, Mel B, and DJ Khaled. Mel B added that she was at his private concert, while DJ Khaled loved his real and authentic lyrics. However, he stated that this show was going to make him a superstar and gave him a Golden Buzzer! In all honesty, I would have waited for another act, because I do not like mimicry and I felt like I was watching an Ed Sheeran copycat and not an original act. Mirror Image returned to the show and to prove Simon wrong. Before they even performed, they received a standing invitation from Heidi to live with her. They sang “California Dreamin’, an average” and I thought that their vocals improved tremendously. Next, they danced to Sia’s “The Greatest,” but Simon buzzed them. While DJ Khaled called it very interesting, but Mel B and Heidi loved their performance. 13-year-old singer Evie Clair drove me crazy with her sob story regarding her father dying in front of her eyes. She performed an average cover of Macy Gray’s “I Try.” While her voice moved the judges, I was not, and I honestly believe that she needs more time to develop vocally as an artist and try out for Idol or The Voice in the future. Magician Colin Cloud is one of my favorite magic acts this season, and I hoped that he delivered a knockout Judges Cut performance. He asked Mel B and Howie to join him on stage. He correctly predicted Mel B’s lunch by licking her hand, while he asked Howie to unlock an iPhone using three numbers that Simon, DJ Khaled, and Heidi. After Howie had unlocked the iPhone with three numbers that he correctly picked out, Colin finished up his business with Mel B and had his assistants in the audience reveal the word that Mel B described herself. Scary Spice stated that she declared herself a “goddess,” and she jumped up and down when Colin correctly predicted her word. Everyone’s favorite clown, Puddles Pity Party, made his second appearance on the AGT stage. While he was still the clown equivalent of Howard Stern staffer Scott the Engineer, Puddles Pity Party delivered a compelling interpretation of Celine Dion’s “All By Myself.” Puddles had one of the best male vocal performances of the season, and his Pavarotti-like final note gave me chills. Mel B stated that she loved Puddles and called him “brilliant,” but Heidi was not impressed. However, Simon said that while he is scared of clowns, he could connect with Puddles. The final act to face DJ Khaled and the judges were 21-year-old Yoli Mayor. I loved her interpretation of Ed Sheeran’s “Make It Rain, ” and I wanted to her to do well with her Judges’ Cuts. Yoli delivered another show-stopping performance with Rihanna’s ‘Love on the Brain.” Of all of the female singers that performed tonight, Yoil showed heart, soul, and hit all of the right notes! Like Tyra Banks stated, Yoli took us to church and received the only five judge standing ovation of the evening! As Yoli left the stage, it was time for DJ Khaled and the judges to deliberate. After saying goodbye to DJ Khaled, Simon and the judges returned to the stage to reveal the results. Joining Chase at the Dolby Theatre for the Season 12 Live Shows were Puddles, Mirror Image, Junior & Emily, Colin Cloud, Evie Clair (Really? ), and Yoli Mayor! Next week, Laverne Cox joins AGT for Week Three of the Judges’ Cuts.